Today when I was about to update my fan page status I saw this contact importer tool just above my page thumbnail. We all search to find how do I increase our FB page fans badly but now if you have a list of customers, members or email subscribers you can use the Contact Importer tool to upload your list to find them on Facebook, and let them know about your Facebook Page. Easy isn’t? Just click on the Import Contact button and there you’ll find two options. Upload Your Contact File & Find Your Web Email Contacts. Upload Your Contact File – Create one file using Outlook, Constant Contact, .csv file, etc then upload that contacts file using browsing option and then Facebook will securely import your contacts. Find Your Web Email Contacts – Searching your email for contacts is the fastest and easiest way to find potential fans. 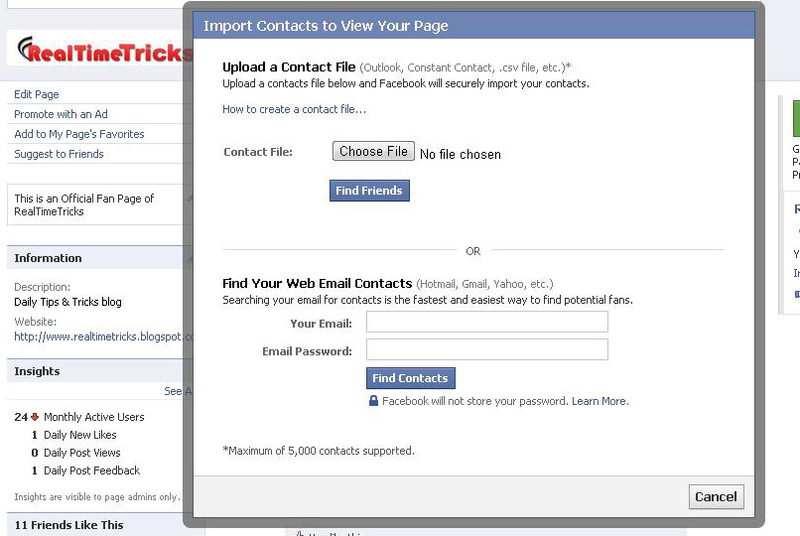 All you need to do is entering your email ID and its password and Facebook will securely import your contacts. Remember maximum of 5,000 contacts are only supported now. Let us know in comments how you’re using this feature to increase your FB page fans. Yeah same here, i think it was just a one day update. You can suggest all your friends and ask them to invite there friends. In this way you'll gain lots of fans for your fb page. When I select import contacts, finder only lists ".jpg" not the .csv file I created. How the freak can I import the CSV file if the interface doesn't work? Hey – I am definitely delighted to find this. Good job!